You are here: Home / Introduction / You Need a Website. Yes, You. Aside: If you know someone who still needs convincing, perhaps a business or professional or cause that has a less-than-effective online presence, this is the post they need to read. The protestations of grumpy old men to the contrary, the internet is all about connecting people. Rather than being isolated, we use it to connect with people physically and virtually, across the street or across the planet. We’re more connected today in more ways than ever before. This is especially important if you have a business, a message, or a cause to promote. If you’re running a business of just about any form, your customers are researching you online. If you’re a professional, your clients are looking for you online. If you’re an author, your readers want to know more about you and your work, and they’re looking online. If you’re a non-profit, both your clients and your donors are looking to online information to find you, and to decide whether or not to support you. And if you’re a blogger, you already know it: your audience is online. Regardless of your role, if you’re trying to reach people, be it the general public or some subset thereof, those people are probably already looking for what you have to offer, and they are looking online. 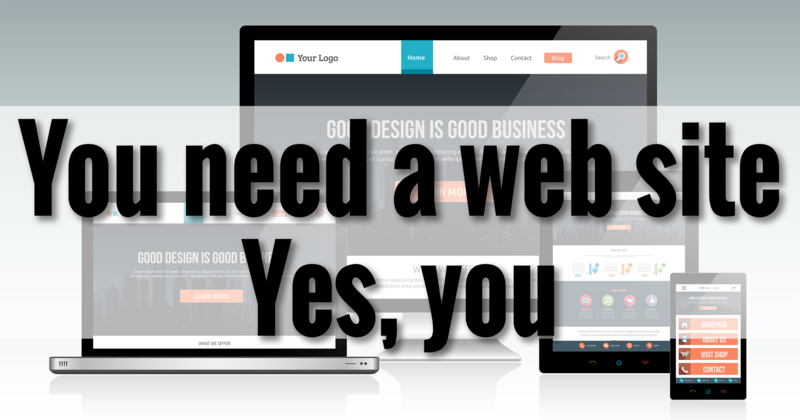 In order to be found, you need to have a web site. Not just any site, but a site that gets found, and gets found for the right things, like the products, services, or ideas you provide, or the location at which your provide them. And, of course, a web site that not only provides information and value, but does so in a professional way that elicits your visitor’s trust. From there, you begin building a relationship. And if you are there, if you do have a web site, why aren’t you doing a better job of it? The internet is a mature medium. People rely on it daily to solve problems, find what they need or want, stumble into things that they didn’t know they wanted, or simply be entertained. On the flip side, people like you – including your competitors, if you’re in a competitive situation – are using it to promote themselves in ways we couldn’t conceive of just a few years ago. If you want to connect with people and stay connected with your audience, your customers, or your constituents, you must do a better job of managing your online presence. The good news is that, as I said, the internet is maturing, so managing that presence doesn’t have to be overwhelming. I don’t care who you are, stop ignoring your online presence. It’s your #1 tool to reach the people you want to reach. (*) Or Bing. Or Yahoo. Or DuckDuckGo. But mostly Google. 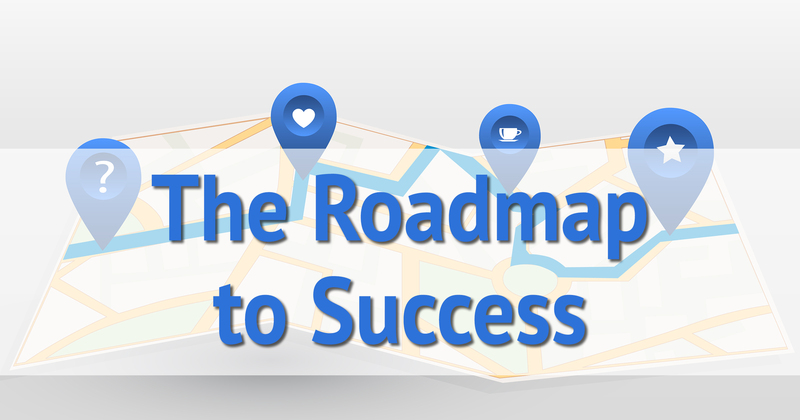 Will you be recommending locations for non-profit web sites AND site building software? We have been using MS Sharepoint, have looked at WordPress, and are seeking other choices. Both some recommendations and some guidelines. (Spoiler: Most folks can do everything the need with WordPress.) Have a peek at the Contents link up in the site menu. WordPress is harder than people make it out to be. I’ve tried it and I’ve had three tutors try to help me build a site. All failures! WordPress is overrated. Well, all I can say is that because of its overwhelming popularity it’s perhaps the easiest to get help and resources for. I do believe it’s one of the easiest to use. There are simpler alternatives, but you end up losing what would otherwise be important functionality, in my opinion. I’ve love to hear what you ended up using instead. Leo I am a small business owner and have just bought a domain name, from godaddy. My biggest concern right is how to find the right email product, right now we use AOL believe it or not lol, and it has worked for the last 20 years. Ounce email is decided on then need to create a web site. We are a truck parts retail and wholesale store. We cater to the 18 wheeler truck parts after market. Leo is it possible to have a phone conversation with you. I know that Godaddy offers help but dont know if I should go with them or not. Sorry, I don’t do phone support. 🙂 While that might help one person (you) it takes time away from helping everyone by working on Ask Leo! and Ask Leo! on Business. There may be ways to keep using your AOL account, but as you may have seen elsewhere, you should not use your AOL email address. If you have a domain of your own, then your business email addresses should all also be on that domain. There may be ways to use AOL to manage that. I use Gmail to manage all my askleo.com and personal domain emails. GoDaddy can be a fine host, yes. I tend not to gravitate towards them only because they have a history of some aggressive up-selling and marketing. But they do have all the tools you need, and support. Finally: NEVER post your email in a public forum. That’s ASKING for spam. I’ve removed it, as you can see, prior to approving the comment. I want to get away from AOL because it does not look very professional when our customers and vendors see email with @aol that’s why I need a email client to use rather than AOL. Just don’t know how to find one. Leo have followed you for many years and cant begin to thank you for all that I have learned in that time from you emails. I think you missed my point – you MAY be able to use AOL to manage your email and have it look like it comes from your domain. Just like I *DO* use Gmail to manage my email, yet it all looks like it’s from askleo.com. 🙂 We’ll get there. Whoa I did in fact miss the point, that would be fantastic as we have 6 email addys on AOL with folders made on each that would be a nightmare to move to a new email client. Leo , I am very excited about this project of yours. As a small family owned business in operation for over 75 years there has been a lot of change in our business as well as our industry but no change has made as much of an impact as on-line selling and marketing. It has been interesting and a struggle to come up with vendors to handle our website. There is a lot of trial and error, costly at times and I am hoping that I can gain a better understanding through this project. 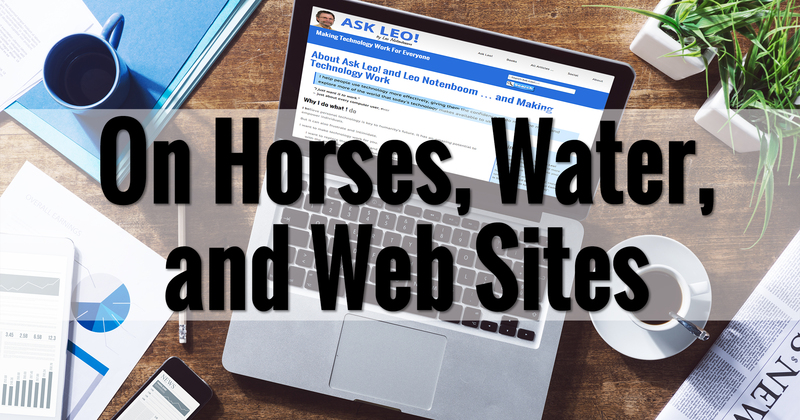 Your other Ask Leo site has been absolutely invaluable to me over the years. Can’t Wait! Thank you so much for your help over the years – keeping an elderly lady in touch with computer info. As a yet unpublished writer of historical fiction, I have reserved a domain name with Go Daddy, but have not actually set up the web site. I’m hoping you start from that sort of beginning. Do you have a book on making and maintaining web sites? I have an American web site and the dollar exchange is making it more and more expensive. We need your expertise, Leo. I don’t yet, but this series of articles is leading up to one. Okay, I’m intrigued by your new venture. I did graphic sign design for several years using CorelDRAW before I closed my business. The most recent version included a download of “Corel Web Designer”, which I have yet to install. I’m totally new to web design, but hope to market my illustration & layout abilities online in some fashion. I am semi-retired, doing some design work for local sign shops. I would like to get more work from the web that is easily provided via email. Some files may exceed the 25MB limitation of Gmail. What suggestions or recommendations do you have that would expedite my getting a web presence?? Is there a better program than the “Corel” one for doing this kind of thing? Finances could be a limitation as I have limited financial resources. My questions may be answered in your future articles. Hopefully some will. I’m not familiar with Corel Web Designer, but most of those programs-that-design-a-website-for-you aren’t a direction I generally recommend these days. I’ll be suggesting that basing a website on WordPress is – for most people – a perfectly adequate and much less involved endeavor, with much more resources and support available. Reason for Bluehost not sowing the .caa extension? It’s a choice – since “.ca” is the top level domain for Canada it appears Bluehost simply chooses not to service that market – at least not for domain registration. You can register anywhere else and use Bluehost, or you can go to someplace that handles it all.